I first learned about cakes that use olive oil instead of butter when I saw an orange cake recipe sample in a catalog promoting this book , and I gave it a try and found it quite tasty. So I was delighted to see an olive oil orange cake as one of the demo items at the recent Zingerman's Tunisian Cooking Demo class. I was intrigued to note that the recipe I tried long ago was attributed to a "Madame Mahjoub", and Onsa Mahjoub was sharing her recipes for the demo class. Are they same Mahjoub? Or perhaps related? The recipes, while very similar, have just enough differences (such as almond extract in the other one) to cause me to wonder if they are by the same person (though, of course, people vary their recipes over time). 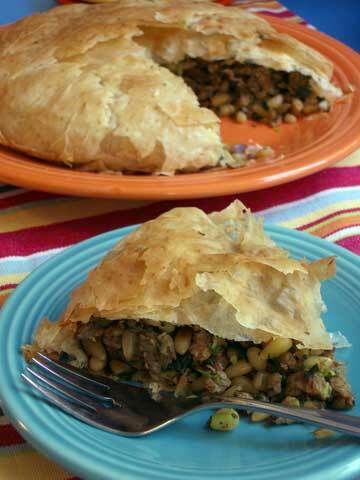 Or did Nancy Jenkins, author of Essential Mediterranean, adapt the recipe when she wrote it up? All very intriguing. Perhaps one of my readers will know. Anyway, this is the recipe as we tried it in class, and it was quite delicious, with hints of bitter orange cutting the sweetness. By itself, some tasters felt that it needed a glaze, but I personally think that if you serve this with sweetened mint tea (North African style!) it doesn't need a thing. Zingerman's testing notes: this may need a pinch of salt and perhaps less baking powder, but you can't really tell until you've tried it with salt. Kitchen Chick's notes: after measuring out the baking powder, I removed about a half teaspoon and put in a half teaspoon of salt. I didn't research proportions of salt or baking powder for cakes. It worked fine for me. Amounts are in metric, so you will need a scale that has a metric setting. Wash oranges. Cut stem and blossom ends off of oranges and discard. Cut in half and remove seeds. Chop into large pieces then puree in food processor to a pulp or in food mill. In a mixing bowl, beat eggs and sugar until frothy. Sift the flour into the mixture. Add baking powder and olive oil. Stir to combine. Add oranges and stir to combine. Pour into baking pan(s). Sprinkle top with sesame seeds. Bake until top is nicely browned and cake springs back when poked gently with finger tip (about 1 hour — less if you're using smaller pans, so be sure to check them). I love North African cuisines with their blend of Mediterranean-Middle Eastern foods and remember with great longing the breakfast pastries we had in Fes, Morocco, so when Zingerman's Bakehouse held a Tunisian bakery demo class I signed up immediately. The demo instructors were Majid and Onsa Mahjoub, of Les Moulins Mahjoub, which produces a range of amazing products from their hand-processed sun-dried tomatoes, organic olive oil, hand-gathered wild capers, and zingy orange marmalade. Onsa demonstrated five different Tunisian breads and pastries, all adapted for ingredients available here in the States, while her husband Majid filled in the history and production methods of their beautifully made organic food products. One of their more intriguing products Majid showed us is their geranium water, a by-product from the "perfume-side" of their business where they process the essential oils from orange blossoms and geraniums, which they sell to the perfume industry in Paris. I keep rose and orange blossom water in my pantry, but I've never seen geranium water before, which as you might imagine, smells of scented geranium. Ari of Zingerman's said that they were going to try to stock it in the future. Onsa brought brik from Tunisia. Brik is a Tunisian bread that is roughly similar to spring roll wrappers (phyllo dough is actually thinner than brik), but has a different texture. She used to make rolled pastries filled with orange marmalade and stuffed fried packets of egg, farmhouse cheese, capers, and sun-dried tomatoes (sort of like wonton or samosa). One of my fellow attendees claims that you can get brik from the R. Hirt company (2468 Market St, Detroit) near the Detroit Farmer's market, or you could try using spring roll wrappers as a substitute. Onsa also made a beautiful orange cake, skillet flat bread (I had this in Morocco, and I swoon for this stuff. ), and two date-based pastries. I was particularly taken by the date pastries. I have these vague fond childhood memories of date cookies, with a thin layer of date between two layers of dough, that my grandmother would buy. So when Onsa made the Kobz Abraj, I was stirred with a powerful desire to make them myself immediately upon getting home. Joe pointed out that we had a tub of dates in the pantry, well... the rest is history. Kobz means "bread" and abraj means "portion", so this is "bread in portion". It's commonly served for breakfast. Onsa likes it with coffee, but I'm a tea person. Summer always catches me by surprise. There's the long build up through Spring, with strawberries and other early crops, while my imagination dances in anticipation for summer peaches and blueberries. In June I watch my garden warily, convinced that none of my tomato plants are going to fruit. I worry that my crop will be small. Then comes the first green tomato, followed by another, and then suddenly my plants are full of tomatoes hiding among the leaves. My first sungold cherries ripen, and I pluck them off the vine and eat them right in the garden. Finally, my veggie garden announces that summer really is here. This year I also planted a number of pepper plants, and when my first cubanelles and banana peppers showed themselves, I eagerly picked them. Use approximately equal amounts of tomatoes and peppers. For example, if you use four medium tomatoes, then use four medium-ish bell peppers. If you are using smaller peppers, then you'll need more peppers per tomato. I used sweet cubanelles with a few hot banana peppers for a touch of heat, but you can also use bell or anaheim peppers. Do not use jalapeño, thai, cayenne, or other peppers that are normally used primarily for their heat as the main peppers, but they can be a nice accent with other milder peppers. Grill peppers and tomatoes until evenly black all over. (Either under the broiler or over a gas stove or grill. Watch out for sparks!) Put in a plastic bag or container and let sit. When peppers and tomatoes are cool enough to handle, pull off the blackened skins. Slit the peppers and remove the seeds and membranes. Chop very, very finely. De-seed the tomatoes and chop finely. Put tomatoes and peppers in a colander to drain. Meanwhile, grill onions until they begin to brown. (You can use your broiler, gas burner, gas grill, or that toaster oven again on the broiler setting.) Chop the onions finely. Squeeze the garlic pulp out of its skins and mash with a fork. Mix all ingredients, salt to taste, and add the olive and caper garnish. 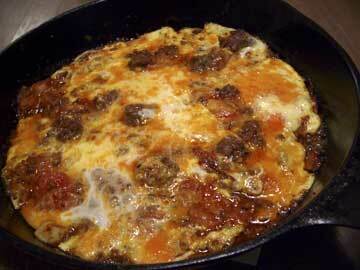 Egg, chorizo, and tomato tortilla just about done cooking. I have three papers due this week. Short papers, but still three different topics to think and write about. Tonight's paper was on Jack Kerouac's Introduction to Robert Frank's The Americans. Tomorrow night it's Cartier-Bresson. But I'm still thinking about last night's dinner. As I mentioned in my last post, I was looking to make something North African and Joe suggested using the chorizo we had as a substitute for merguez. Mmmmm.... merguez. I may have to learn how to make my own merguez because the mere thought of it makes me swoon. But not having merguez, I went with the chorizo, which is itself its own kind of wonderfulness. The resulting dish probably wouldn't be classified as North African, but this was inspired by a recipe in From the Lands of Figs and Olives . Heat oil in frying pan over high heat until shimmering hot. (Use a 12 inch skillet for a thin tortilla, and a smaller one for a thicker tortilla.) Add sausage, garlic, and caraway. Stir frequently until sausage is lightly browned. Add tomatoes, water, salt and pepper. Lower heat to medium and cook until most of the liquid is absorbed. This can take 10 minutes or so. With chorizo, after the water is absorbed/cooked off, you'll have a fair amount of oil in the pan. I guess you could drain some of it off. I didn't. There's too much flavor in that oil! Break eggs into a bowl and whisk briskly. Pour into sausage mixture. The original recipe says to stir gently over low heat until eggs are done. I prefer to stir very little at all and let the mixture set like an omelet or Spanish tortilla. To get the top of the eggs to cook, I put a lid on the pan to trap the heat. - Polish, Italian, or similar sausage. I suspect this is a substitution for merguez. The bell peppers are added after the tomatoes cook and the water is absorbed, and the mixture simmers for 10 minutes more. 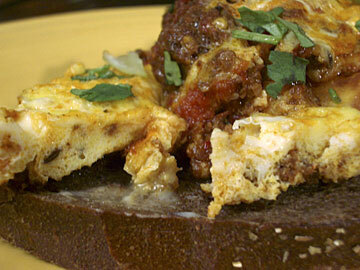 The eggs are stired gently, making a scrambled-egg dish instead of a tortilla-style dish. It's been a bit crazy around here. I'm taking two classes this semester in addition to working nearly fulltime. I can discourse endlessly on the pictoralist and modernist movements in photography and the impact of photography on social welfare movements, but that doesn't get dinner on the table. And as the homework load has increase, more dinners have become "scrounge nights." Last night, however, I was determined to find something tasty and fresh and quick. We were talking about North African food, and Joe thought the chorizo we had could substitute for merguez. Chorizo is generally made with pork, red pepper, and paprika; and merguez is made with beef or lamb and flavored with harissa (a chili paste) or paprika. 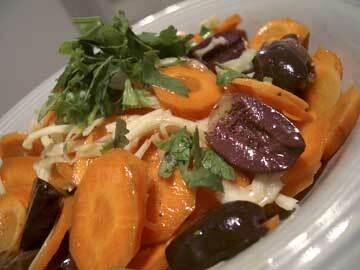 So I dug up From the Land of Figs and Olives, my favoriate pan-North African cookbook, and found a suitable recipe. It was a smashing success, but you'll have to wait until my next post. I wanted something light and fresh and healthy (i.e. more vegetables!) as a side. This carrot and olive salad turned out to not only be tasty in itself but also to be a good pairing with our sausage dish. Right before serving whisk olive oil, lemon, and salt and pepper to make an emulsion. Toss with salad ingredients. The original recipe calls for a small head of chopped lettuce. I didn't have lettuce, but I had some cabbage. I wanted to keep the carrot and olives as the dominant elements, so used only a small amount of cabbage and very thinly sliced it. The cabbaged worked well enough that I've scribbled it as a variate to the recipe in the page margins. I used kalamata olives, but North African varieties are becoming increasingly available in the States and are worth a try. I didn't expect to do IMBB this month. I've been so busy of late. But I had a feeling this was the weekend, so I checked in and discovered that, yes, this weekend is IMBB. And with such an eggs-ellant theme, courtesy of Seattle Bon Vivant, I knew I had to make time. I love eggs. In fact, this morning I made hollandaise sauce for a Benedicty-like breakfast of fried egg and bacon on toast with hollandaise. Ok, the bacon made it a bit excessive. It pleased me that I had unknowingly already fulfilled the IMBB with my hollandaise sauce, but I desired to do something a little less common with the common egg. I pondered for a bit, checked a few cookbooks, rummaged through the cubbards and fridge, and came up with an eggy dish that pleases me quite a bit. I had my first bastila ("ba-stee-ya") at a North African restaurant near D.C. They used chicken instead of squab. I was in heaven. I have yet to make a chicken bastila, but some years back I discovered Kitty Morse's savory cashew bastila recipe from her The Vegetarian Table: North Africa cookbook. I was out of cashews, but I had pinenuts. (Mmmm... pinenuts.) The cashew version is yummy, and, I must say, it works quite well with pinenuts too. 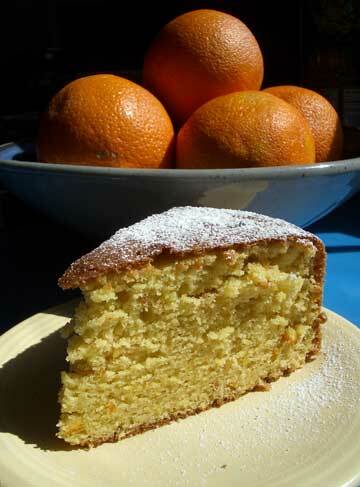 From Nancy Harmon Jenkins's book Essential Mediterranean comes Madame Mahjoub's orange cake recipe. This plain-looking cake is a delight in disguise and perfect with tea. The original recipe calls for the Maltaise de Tunisie blood oranges and claims that they give the cake a beautiful red blush. I didn't have blood oranges the first time I made and used ordinary juice oranges, and it was delicious anyway. I tried it again with the blood oranges available here in Michigan, and it came out greenish-brown instead of the claimed "red blush." It was still wonderful, but if you think your guests would be put off by the odd color I recommend sticking with thin-skinned juice oranges. Jenkins makes a point of saying the entire orange (minus seeds) is used, so I would shy away from using navel oranges as their skin is so thick compared to blood oranges. 2 small blood oranges (or thin-skinned juice oranges). Organic preferred, as you'll use the entire orange. Pre-heat the oven to 350 degrees F and butter and flour your cake pan. Wash oranges thoroughly to remove pesticide and wax residue. Slice tops and bottoms off of the oranges to remove the thickest part of the skin and discard. Chop oranges into chunks and discard the seeds. 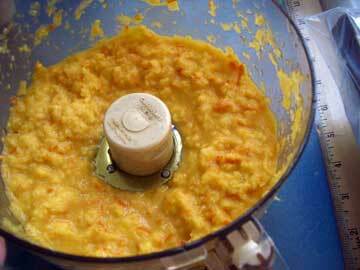 In a food processor, process the oranges into a chunky puree. Add the olive oil slowly and continue to process until it is well blended. In a bowl, sift flour, baking powder, baking soda, and salt. In a large bowl, beat eggs thoroughly and gradually add sugar until mixture is thick and lemon-colored. Add vanilla and optional almond extract. Fold about a third of the flour mixture into the eggs and beat until mixed. Fold in about a third of the orange mixture and beat. Continue to add flour and orange mixture until everything is combined. You'll have a chunky batter. Pour batter into cake pan. Bake for 60 minutes or until cake is brown on top and has pulled away from the sides of the pan. Let cake cool. If you used a spring form pan, remove the sides. If not, then let cool for five minutes then remove from the pan and allow it to finish cooling. After it has completely cooled, dust with powdered sugar. Way long ago when I posted about Carrot and Chickpea Stew, I mentioned that I'd post a recipe for harissa. I really love this stuff. It's great on the stew, on bread, with hummus and pita... even plain. Back when North African foods were only just becoming trendy here in the US, I even toyed with the idea of selling harissa in a sort of one or two-(wo)men way like Ann Arbor's Clancy's Fancy hot sauce. This recipe from Kitty Morse's (one of the goddesses of North African cooking) The Vegetarian Table: North Africa isn't particularily hot, but you can make it that way by using hotter chilies. Seed chilies, cut into pices, and put them in a bowl. Pour hot water over them and saod until they turn quite soft. 15 minutes to 1 hour. (I've generally found 15-30 minutes to be enough.) Drain them and squeeze out the excess water. Place the chilies and all other ingredients in a food processor. Process to a paste. To store: place in a small glass jar with a thin layer of olive oil over the top and seal tightly. Mix all spices and use immediately or store in air tight container. The first time I cooked Moroccan bread I used a recipe from Paula Wolfert's Couscous and Other Good Food from Morocco. The bread was amazing. The second time I made the recipe, the loaves didn't rise and were small and dense. What had I done wrong? And the third time — once again too small. I became terrified of making yeast bread. 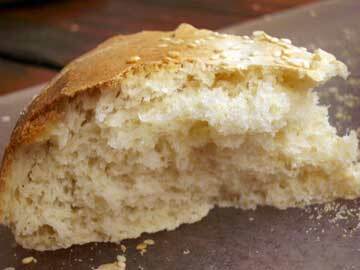 Half the time the loaves didn't rise. Clearly much practice was needed. I suspect I may have been killing my yeast. I'm more careful now. I test my water temperature carefully. But there's always that nugget of fear as I watch my yeast for signs of activity, or worse, inactivity. So there was much relief when I saw my yeast become frothy with bubbles. Most recipes I've seen for Moroccan Bread usually use whole wheat flour or a blend of whole wheat and white flour. 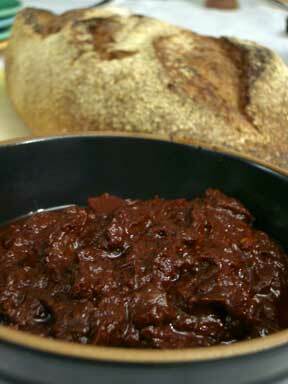 This recipe from Kitty Morse uses all white flour and is very light textured. I love North African food. I love Kitty Morse's cookbooks. I dream about taking one of her tours. I don't generally like group tours, but I think I could really get into a food tour. Anyway, back to tonight's dinner. 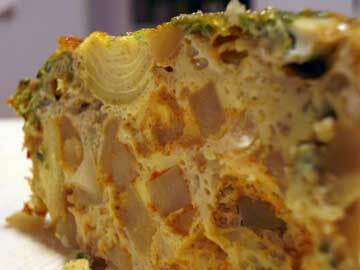 An Algerian markode is like a thick meatless, crustless quiche, similar to a Spanish tortilla. This one uses potatoes and artichokes. I love artichokes. Joe does not. I've had this long sort-of back-burnered quest to convince him that artichokes are gifts from heaven. Tonight I've finally managed to convined him that artichokes are harmless. I count that as success. It means I can cook with them and he won't turn his nose up. As long as I don't cook with them too often. This makes a simple dinner or a nice first course to a larger meal.